Seniors can now register for Medicare's new prescription drug plan. President Bush says the benefit is the greatest advance in health care for seniors since the creation of Medicare 40 years ago. The government estimates that on average, the Medicare drug program will save beneficiaries about 50 percent on their prescription drugs. To enroll, seniors must choose a private insurance plan to cover a portion of their prescription drug costs. In Minnesota there are 41 individual drug plans available. In addition, there are more than 20 other drug options that piggyback on existing Medicare health coverage. For many seniors, the choices are confusing and frustrating. 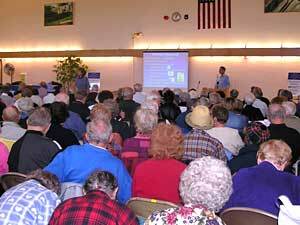 St. Paul, Minn. — At a forum in Roseville recently, nearly 400 seniors squeezed into a community center auditorium to hear about Medicare's new prescription drug plan. Minnesota Senior Federation organizers scrambled to find enough chairs for everyone. By the time federation researcher Jerry Maher started his Medicare slideshow, the front row of the audience was packed to just a couple feet from his podium, and the chair rows were so long that they extended to outer edges of the room. "I realize that many of you don't have a good view of the screen because you're too far away in one direction or another," said Maher. "So I'll try to make sure that I actually say everything that's on the screen, unlike what I usually do." Maher told the crowd that everyone who's eligible for Medicare is eligible for the new prescription drug benefit, which is called Medicare Part D.
But Maher warned them that just because they qualify, that doesn't mean they automatically get coverage. They have to sign up for it. And, they have to do it within the next six months to avoid paying more for their coverage. Before they do any of that, Maher told seniors they have to pick an insurance plan. There are more than 60 choices, and they vary widely in what they cover and what they cost. "Many of the plans have what we call tiered co-payments," said Maher. "Now what the devil is a tiered co-payment? Well, what they've done is lumped the drugs into various categories, and each category carries a different co-pay." There are different monthly premiums for each plan too. In Minnesota, they range from $1.87 a month to almost $100 a month. Besides premiums, there are co-pays for drugs, and some plans also have a deductible. Then there are out-of-pocket expenses that are part of a required gap in coverage that was built into the vast majority of the programs. The idea is to make sure that all patients share in the cost of their drugs. Some plans provide limited coverage within the gap between $2,250 and $5,100, mainly in the form of drug discounts or co-pay discounts. One of the Medicare Advantage plans does not have a gap in coverage. Seniors with very low income and low assets might be able to qualify for subsidized drug coverage to cover the gap in coverage. The coverage gap means that seniors who use a lot of prescription drugs might have to pay several thousand dollars out of pocket. But after that gap is covered, their catastrophic drug coverage kicks in and pays 95 percent of their prescription costs for the rest of the year. There are other issues to figure out too. The drug plans contract with specific pharmacies in their network. So seniors need to make sure the plan they pick fits with the pharmacy they want to use. After the forum, retiree Cap Hanson complained that he was no closer to making a decision on whether to sign up for the program. "I'm trying to decide, but I'm totally confused. Totally confused. He hasn't clarified one thing. Not a thing. I still don't know what plan to choose if I were to choose one," said Hanson. Anne Korpi said the government wasn't doing a good job of explaining the plans. "I feel that the government is making it terribly confusing," said Korpi. "I would prefer if they would use plain English and so that people can understand it and follow it easier." Unlike Hanson, Korpi has decided to sign up for the plan, and she already knows which plan she's going to pick. She made that decision several days before attending the forum. "I figured out what my expenses are, and figured out the premiums, and that helped me in decision-making which program to choose," said Korpi. "I did homework for at least three hours." It really does matter which plan somebody chooses. For someone who takes a lot of medications and has high drug costs, the difference could be in the hundreds, if not thousands of dollars. Shirley Rosenbaum figured she will have to spend at least that much time picking out her plan. Rosenbaum's prescription drugs cost almost $6,000 a year, so she's pretty sure the Medicare drug program will save her money. But when she spoke with drug plan representatives after the meeting, she had a hard time finding out whether her drugs are covered under their plans. "It's pretty hard because you can't get really specific unless you get someone actually one on one. That's the thing," said Rosenbaum. "Trying to find what drugs are covered is the biggest problem, because that's the only way you're going to be able to find out whether it's going to help you or not." Other seniors are wondering why they're being encouraged to sign up for the program now, if they don't have high prescription drugs costs. Doug Mattson and his wife Maryann don't need the coverage yet. "I don't think any of them are going to make sense, because we don't spend as much money in a year for either one of us for drugs as the premium will be, or even the $250 deductible," said Doug Mattson. "We don't have that high of drug costs." If the Mattsons don't sign up during this enrollment period, they will have to pay a penalty if they ever do want to sign up. The penalty equals 1 percent of a plan's premium for every month that a senior is qualified for approved drug coverage, but doesn't take it. Patricia Neuman with the Kaiser Family Foundation, a nonprofit, nonpartisan organization that studies health care issues, says the penalty is designed to encourage healthy seniors to enroll right away. "The reason the penalty is in place is because the program really can't work if only sicker and expensive people sign up," said Neuman. Neuman says the Medicare drug plan won't be successful if a majority of the 43 million seniors on Medicare don't join the insurance risk pool. But that remains a tough sell with seniors. Kaiser's own poll found that 39 percent of them don't believe the benefit will help them. Only one in five seniors in the survey said they planned to sign up. Neuman thinks some of their concerns might simply be a matter of misunderstanding. She says their poll showed two-thirds of seniors say they still don't understand the drug benefit well or at all. "What surprised us somewhat is that we thought understanding would be rising, because the government is doing so much more to make people aware of the drug benefit," says Neuman. "But I think what we're seeing is while people are more generally aware, they're not specifically understanding what it will mean for them. And that's really the most important question." Neuman acknowledges it is a complicated program. She says she's personally been helping some seniors try to figure out what plan is best for them. Besides taking a lot of time and energy, it's also possible to make a costly mistake. "It really does matter which plan somebody chooses," says Neuman. "For someone who takes a lot of medications and has high drug costs, the difference could be in the hundreds, if not thousands of dollars. So this is a very important decision for many seniors who live on fixed incomes." Neuman says it's crucial for many seniors to get some one-on-one help, whether it's from a family member, a friend or a pharmacist. Seniors can also call 1-800-Medicare for assistance. Or if they're comfortable using the Internet they can go to the Medicare.gov Web site for details on all of the drug plans. The new Medicare prescription drug program takes effect on Jan. 1, 2006. Enrollment continues until May 15, 2006.